1. Single pass water treatments where the source is a well, lake, river or salt water. 3. 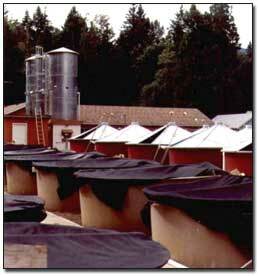 Effluent sanitation from quarantine stations. There are hardly two identical aquaculture operations in the world. AZCO's engineers are ready to review and utilize your existing equipment (such as aeration towers, pumps, filters and buildings) to be fitted for the new purpose. In order to do so most efficiently, please answer the attached Aquaculture Questionnaire . Your answers will be kept in strict confidence. The systems are engineered for fully automatic and worry-free operation, many features are included to prevent an ozone overdose. Any single failure will not result in the killing of the fish. There are hardly two identical aquaculture operations in the world. AZCO engineers are ready to review and utilize on-site existing equipment (aeration towers, pumps, filters, and buildings) to be fitted for the new purpose. In order to do so most efficiently, please answer the attached Aquaculture Questionnaire. Our systems are engineered for fully automatic and worry-free operation, many features are included to prevent accidental ozone overdose. The systems are easy to operate and maintain.